This project is a great combination for National Scrapbooking Month and Stampin' Up! 's awesome special on Designer Series papers! The special is a buy three, get one free deal! Check out more details on my website! Using the Sizzix Big Shot Top Note Die makes this project super easy and quick to complete. I ran some thick paper through the Big Shot. To be honest, I used an old cereal box. You could use the thick sheets that come in the Designer Series paper package, chipboard or whatever you'd like. I then ran my designer paper through and adhered it to the thick paper board using Stampin' Up! Anywhere Glue Stick. The glue stick works great and it's not as messy as Mod Podge and it dries quicker too! The faux filmstrip was created using the SU! Spiral punch. I just cut the width to fit the Top Note and punched the edges. You can make this as long or short as you want, as long as you fold it to fit inside the Top Note. You may need to attach more than one sheet of card stock to get your desired length. 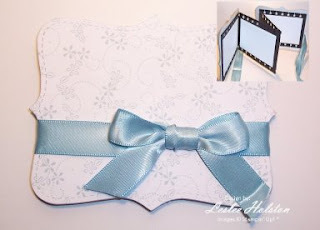 Add your photos (or not), wrap a coordinating ribbon around it to hold it closed, embellish as desired (or not). You're done! I embellished each Top Note as I went with ribbon and brads and hardware. Punched a hole using the Crop-A-Dile in the corner. The Crop-A-Dile will punch a hole through chipboard like it's butter! I then slipped the Top Notes on a jump ring and embellished the ring with coordinating ribbon. Who wouldn't love to receive this as a gift? Thanks for stopping by today! I hope you've been inspired to try this simple mini scrapbook. Come back soon for more projects and ideas.